RAW format images offer more options for editing than JPEG formats – RawTherapee brings this potential to Linux. Just imagine the disappointment: When you get back from vacation and check your snapshots on your PC, you find out that your favorite image is color cast and the darker sections totally lack contrast. If you used the typical JPEG format, even the most capable image manipulation program would offer little help in restoring the shots. RAW format images, on the other hand, contain far more image data, which provides greater opportunity for post-processing (see the box titled "RAW Digital Negatives"). For example, you can correct underexposed images without affecting the quality of the original. Camera manufacturers such as Canon and Nikon use proprietary RAW formats, and you typically need a commercial Windows program to open them. To avoid the Windows trap, try the freeware program RawTherapee  (Figure 1), which is based on DCraw . RawTherapee can open nearly any RAW format, and it has a huge set of manipulation features. The project website  compares RawTherapee with other RAW converters. The program is also useful for editing JPEG- or PNG-formatted files. 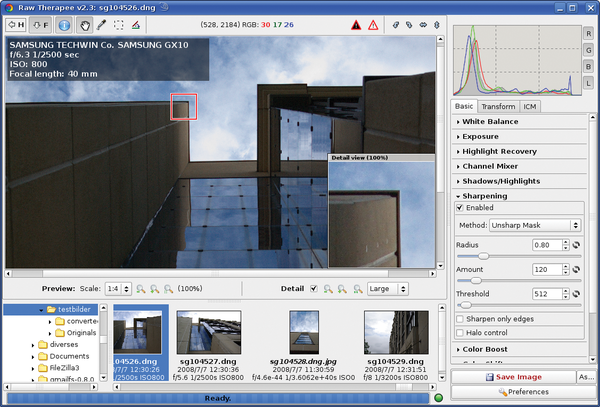 Figure 1: The free RawTherapee program not only supports most RAW formats, it also has a full set of image manipulation tools to help users optimize their photos. In this article, I describe the stable version 2.3. A beta version of the 2.4 release is also available for download. Version 2.4 offers comprehensive metadata support (Exif and IPTC), that 2.3 lacks. Lossy image formats such as JPEG go through a number of processes in the camera: interpolation of individual pixels, as well as various optimizations, such as sharpening, white balance, or noise compensation. When you store an image in RAW format, the camera avoids this workflow and writes the data captured by the photo sensor directly to the memory card. The advantage is that all the information is kept in its original form; the optimization process is the photographer's responsibility. The disadvantage of this approach is that it takes five to seven times more memory compared with JPEG. In addition, internal processing is slower. The RAW format's biggest advantage is the information density of the images: Whereas JPEG only saves 256 luminance levels per pixel (8 bits), RAW uses 4,096 (12 bits). In practical terms, this means a vastly extended colorspace and improved contrast, which in turn gives you far more power to manipulate the original image. Exif: Exchangeable image file format. A standard for the file format that modern digital cameras use to store information. IPTC: Or to be more precise: IPTC-NAA, International Press Telecommunications Council – Newspaper Association of America. A standard for storing text information of image content on arbitrary media (text, photos, graphics, audio, video). IPTC gives users the ability to store copyright information (author, title, keywords, etc.) directly in the image file. The first step is to download the tarball for your system from the project homepage. Then unpack the archive and copy the new folder created by this step to your home directory. To launch the program, click the rt file. The basic settings – such as the local image directory or storage format – are available in the Settings menu in the top right. To load images for preview, use the integrated Directory and file browser (bottom left) to open the directory with the RAW files. This step displays the images in the directory in the preview pane on the right. Clicking on an image loads it for editing in the main window. Information on the photo, such as the camera type used, the aperture, shutter speed, and focal length are displayed when you click the i icon in the menubar. At the bottom of the editing window are the settings for the Preview. RawTherapee displays changes in real time, so you might want to set Scale to 1:3 or 1:4 to avoid major delays in displaying the images. If you enable the checkboxes next to Details, a red frame appears in the image, and an additional Detail view window appears showing the section within the frame at the original size. To move the selection, just press the right mouse button and drag the frame. The Editing profile pull-down offers three different defaults for image optimization. The neutral option leaves the image as is, default sharpens slightly and corrects the brightness, and crisp additionally adjusts the contrast. The program also creates a separate editing profile for each image and saves the profile in the same directory as the images themselves. If you re-edit an image, RawTherapee automatically loads the matching profile. If you want to apply the settings from one image to another, you can store them in a separate profile and open the profile along with the image you want to edit. The program does not have support for batch operations; however, the developers have a beta version with batch support on the roadmap. The tool never modifies RAW images, but it stores the modified data in JPEG, TIFF, or PNG format with a color depth of 8 or 16 bits. Editing tools are available in the pane to the right of the main window. The menu items are ordered to support a practical workflow, and it makes sense to keep to this order. Clicking a tool opens the matching editing options. One common fault seen in images is color casting because of incorrect white balance. To correct this, you can click the set manually box in the White balance tab. Then, move the pipette to a neutral section of the image like a cloud or a wall. The RGB values are shown at the top of the window. Left-click to accept the selection, and then correct any imbalance by dragging the Color temperature and Hue sliders. RawTherapee is undisputedly the number one Linux program for reworking digital images into RAW format. With the license change the program becomes free software. The RAW format preserves the full splendor of digital image data. You can develop this material into a format for everyday use with LightZone. The Gimp revamp is in full swing. We look at developer version 2.9.1 to explain the new components and features that are expected to find their way into the Gimp 2.10 major release. Graham tears himself away from updating Arch Linux to search for the best new free software.